We were a group of five tourists from Hong Kong. 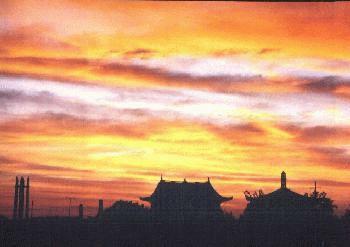 We planned to go to the Philippines by ourselves and finally we arrived at Manila on the 30th March, 1996. We spent ten days in the Philippines. During these ten days, many things, good and bad, happened to us. I would like to share these experiences with anyone who is interested. The first day of our trip was just to let us rest and gather tourist information. The second day was a GREAT day for us. While we were visiting Rizal Park, my friend hurt her head and we had to ride a police van to the public hospital. Although we were upset, it was a really good experience with the local police who were helpful and kind. My friend was all right and we were able to continue our trip. The third day was a really busy day. We set off very early to catch the plane and we arrived at Tagbilaran Airport in Bohol at 9:00 am. In Tagbilaran, we could see many people and many tricycles (motorcycle with passenger sidecar). The tricycles are amazing because of their capacity. One could carry our whole group. Finally we arrived at Alona Beach which is a very beautiful place with blue sky and green sea around you all the time. 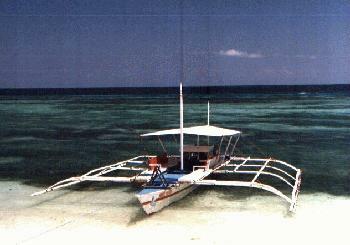 We immediately changed into our swimsuits then hired a pumpboat to nearby Balicasag Island. It took about an hour to get there. At Balicasag, we spent the rest of the day snorkeling in the clear sea among the colorful coral fishes. We returned to Alona Beach that evening where we had dinner. The mango juice and seafood soup are delicious and highly recommended. 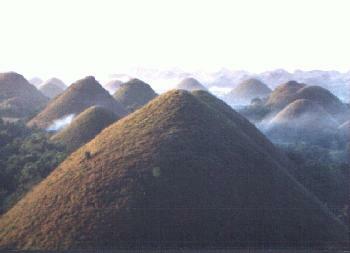 The following day we took a van to the Chocolate Hills in central Bohol. On the way, we explored Hinagdanan Cave (underground pool) and visited the oldest church in the Philippines. When we arrived at Chocolate Hills, we joined a tour to travel around. It was another exciting and unforgettable experience because we had to ride two motorbikes with two guides. That meant that one motorbike carried three people and the other carried four. The rough roads made it even more exciting. We visited the entrance of the National Park, the Loay bridge and the waterfalls in Loay. We also saw two cute tarsiers the smallest monkey in the world. One was a baby and was smaller than your thumb! This day ended with a beautiful sunset. 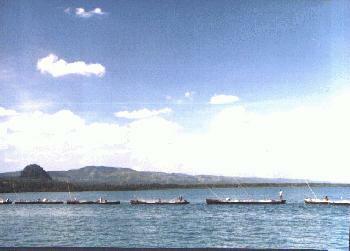 On our fourth day, we took the boat from Tubigon to Cebu. On the boat we could see the dolphins in the sea. We felt we were so close to nature. Because of the time limit, we could only spend a half-day in Cebu. However, the traffic jam there scared all of us! The fifth day was the most disappointing day. After returning to Manila, we joined a local tour to Pagsanjan Falls but the people there were so commercial and they always asked for tips. After that we went to the city of San Pablo. We loved the city very much because it is quiet and the people there are kind and warm. Because of the Easter festival, we had a chance to see a Philippine fiesta celebration. However, because of this festival, we had a hard time the following day. We had planned to trek Mt. Banahaw but there were thousands of people on religious pilgrimages. The road was jammed with people and littered with rubbish. This upset our plans and we quickly returned to town. The next day we took a jeepney to Los Banos and visited the University of the Philippines. The scenery was good and the environment is quiet and comfortable. We spent one night there before returning to Manila. In Manila we went shopping and visited two cemeteries: the Chinese Cemetery and the American Cemetery. To our surprise, both of them had good scenery and we took many photos. To us, the ten days were so short and there are so many places that we haven't been to. Hence, we plan to visit the Philippines again next year. If you have been to the Philippines, you will know that one time is not enough!